Hi, I’m Mike Battel, the owner of GetAGoalie.com. Before starting the company, I had been playing regularly as a dusty beer-leaguer and a "hired gun" for whomever called me to fill in for their team or pickup skate. With a family at home as well as a full time job- I obviously couldn't cover all of the skates i was getting called for. So I started reaching out to a few fellow goalie friends to help get all of the openings covered. Little by little- the calls started rolling in more frequently, and the list of goalie friends grew and grew. 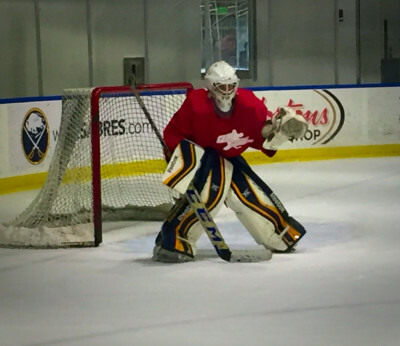 Living in the burgeoning hockey hotbed that is Western New York- I realized there was no comparable service for goalie rentals here. So I took it upon myself to start the first and only Rent-A-Goalie business available in the city that prides itself as "Hockey Heaven" -GetAGoalie.com. Since starting the company- other cities have seen the light! We have offered our services in both Buffalo and Chicago. Don't have such a service in your area?? Feel free to contact us about starting a branch! At GetAGoalie.com- we know it’s not easy to find a goalie and hockey’s never fun with an empty net. That’s why we'll make getting a goaltender as easy and stress-free as possible. All you need to do is let us know the where and when and we’ll take care of the rest for you. And if it’s a last minute call for a Rent-A-Goalie, we can help with that too! It is our #1 priority to supply reliable and qualified Rent-A-Goalies to hockey teams who need a goalie in a pinch. We also pride ourselves on providing excellent customer service and speedy booking times that exceed any and all expectations. Whether it’s for adult leagues, late night shinny, pond hockey, 40 and Over, or anything in between, we have a goalie that will meet your teams needs! Need a goalie for the entire season? Tournaments? Corporate/Company skate? We've got those covered too!! Our goalies are some of the best in the area. We keep a roster of over 50+ goalies per city that range from ex-college and junior players to some with only a few years of experience. All of our goalies are qualified before joining and are regularly reviewed to make sure we provide the right goalie to your skates as well as maintaining the highest standards of customer satisfaction. Need to rent a goalie? Simply click here and fill out our short goalie rental form. Our online email system is what allows us to serve our clients quickly and efficiently. Once you have filled out the online form we will respond to your request ASAP with a confirmation that we have received your email and we are working on booking you a goalie (usually within 30 minutes). You will then receive another confirmation once we have filled your game. If you do not have access to email, you may also call/text us at (716) 903-4130 . Thanks for choosing GetAGoalie.com. We look forward to filling the net for you!